Class 11 Subject Wise important Chapter For JEE Main: JEE Main is an all India common engineering entrance examination and one of the most competitive undergraduate exams. While it is deemed to be one of the toughest entrance exams to crack, it is not quite difficult to figure out its important chapters. Unlike scoring 90+ in other board exams is mandatory to get into a good college, JEE Main, on the other hand, requires a candidate to score close to 50% to get into the best institute. To fetch a 50% score in JEE Main, it is highly important for a candidate to focus mainly on those topics that offer high weightage, low effort and high weightage, high effort. Along with the current chapter of class 12 you also have the task to revise the chapters of class 11. 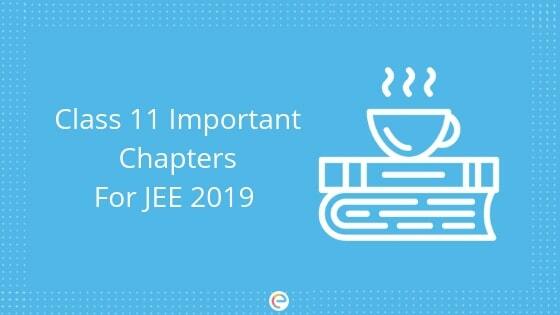 You may be wondering which are the class 11 important chapters for JEE Main 2019 in order to revise quickly. A solid data-based study and research have led to helpful conclusions and here they are. In this post, we bring to you the important chapters for the JEE Main from Class 11 syllabus. Embibe academic experts have divided the chapters based on the ratio of how much ‘weightage’ against how much input (the effort to learn and understand) they require. Note: The above said two sections like- Low Weightage, Low Effort, and Low Weightage, High Effort are not of much importance. Students can chuck these two parameters and rather focus on High Weightage, Low Effort, and High Weightage, High Effort to reach their desired goal. We hope this sheds some light on how to crack the JEE Advanced by brushing up the Class 11 syllabus. Use the rich data and personalized analytics of Embibe as you practice and take mock tests during your JEE Main preparations. Watch your score soar by 15-20% in just 2 tests! Practicing papers and taking mock tests not only help you evaluate your performance but also enhances your preparation for the exam. It’s time to gear up and do smart work with a proper strategy. Knowing all the important topics will help you focus on the most relevant and important topics boosting your score. Embibe also provides you with the best-personalized assistance to improve your score with RANKUP. Guarantee your rank improvement now! We hope this article on Important Chapters of Class 11 for JEE Main 2019 helps you. If you have any question you can post it in the comment box below. We will get back to you on that at the earliest. This is a very useful information for IIT JEE Exam. You can go through this article to know about the jee main important topics.